Because we've got a fairly small group of SU Demo's with blogs I decided to extend the Inspiration posts to include Australian Demo's. Since they get the same products we do, we can share ideas across the ditch. I've also added another Link List in the side bar for "Aussie Blogs" so if there are any Aussie Demos who want their blog added to this list, just email me with your details. 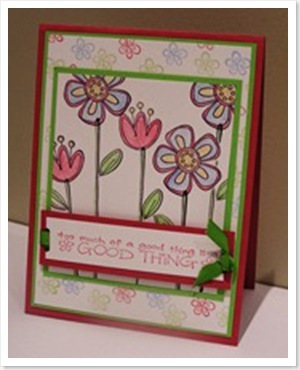 Tracy always has gorgeous cards on her blog Stamping All Seasons. I just love this gift that she's made for her friends wedding, very elegant. I hope Tracy enjoyed her time up in New Plymouth today. Seriously - this girl's gonna send me broke! Every time I visit her blog, which is starting to become a daily habit, and see the fabulous work she's doing, I add another stampset and/or accessory to my wishlist. 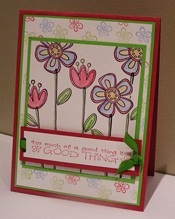 Check out Sarah's blog thINKingstamps for details on this card and her other delicious work! Last One For the Day.. I wasn't going to post again tonight, but I'm a woman and I'm allowed to change my mind. This is another scrap page for Baylee's album, you all must be getting sick of them by now. But I've only got two left and I'll be all caught up. This is her 3 year old page, and it was inspired by 3 people, the Stem Silhouettes over French Script came from a card I made at Stamp Club with Michelle, the Butterfly from a card off Amber's Blog, and the colours from a card off Sarah's Blog. For once I remembered who, that makes a change. Now it's time for bed, I'm sure Bella will be up early, hopefully not 5am again, and we're booked into the gym tomorrow. Nite Everyone. I know it's late but I had to wait for my order to arrive. So finally here's my entry for the April Challenge. Check out my blog Made By Me for the recipe. 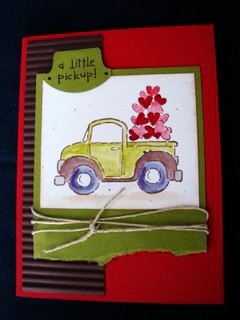 Sarah created this beautiful card using the new Priceless stamp set, she also used the 'rock & roll' technique. Things have been quiet on the blog front, I guess there are lots of people away enjoying conference in Brisbane. But there are a few of us still here, Sharlene isn't one of them, she's in Brisbane at the moment as well, but she did manage to publish this before she left. 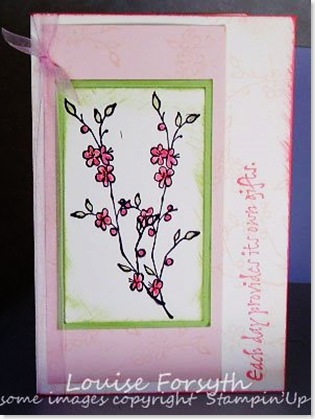 Check out her blog MagpieCreates for more details on her card. Don't forget the April Challenge, we want to see your creations using the fab new products from the New Catalogue. I find it difficult coming up with masculine ideas for cards etc and when I saw this on Sarah's blog I saved it straight away to my desk top. 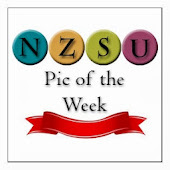 Sarah's blog thINKingstamps has only just been linked on NZSU and already I'm falling in love with her layouts. Check out her blog for details on her Frybox. I love visiting Louise's blog Punknscrap, she's frequently adding gorgeous cards and layouts. This is just one of them. Check out her blog for details on the card. Here's a card for today. 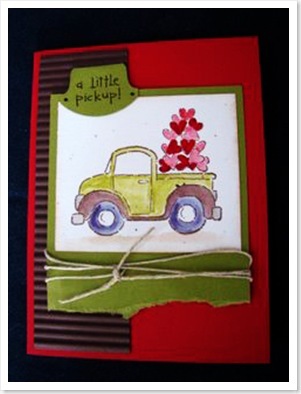 This one's from the archives of Sharlene's Blog <--Click Here to see details on the card. I love this card because the colours are just great together, and it's simple but effective. Also it uses a stamp set most demo's have from the start up kit and it's still available in the new catalogue. The main reason for this blog is to inspire. To share our love for stamping and paper craft. 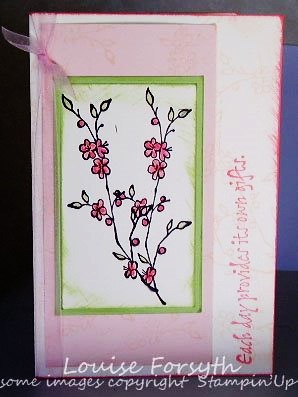 So I thought I'd try and display a card/scrap page/3D project every few days from different blogs from NZ stampers and demos. If you come across a card that inspires you, email me at trudi.hopkinson@xtra.co.nz with the link to the card and I'll post it under the title Inspirational and include a link to that person's blog. This idea came after visiting the blog Inspirational, it showcases papercraft projects from around the world and has absoutley gorgeous work on it. Check it out. Remember if you're looking for inspiration for a particular stamp set, check out the labels down the side, all the sets featured on this blog are listed and the list is frequently added to.